MLB Signature 3 Marker and Divot Tool Set (All 30 Teams Available) - $14.95 - GolfersEdgeOnline.com - Best Golf Equipment On The Web! The Team Golf Divot Tool and Ball Marker Set is a must-have accessory on the course. The set includes a sleek divot tool and three double-sided, enamel, magnetic markers. Each color-filled marker features the official MLB logo of your favorite team. 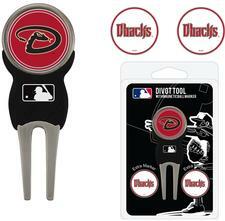 Show your team spirit on all 18 holes with the Team Golf Divot Tool and Marker Set. If you have any more questions about the MLB Signature 3 Marker and Divot Tool Set (All 30 Teams Available); do not see the model you are looking for; need custom options; or prefer to not purchase online, then please call us at (630) 656-1291.